During the early 1900s, a man named Albert John Stevens built engines for use in the frame of motorcycle manufacturers along with his brother. In 1909, the brothers finished their first complete motorcycle, a British bike virtually identical to motorcycles manufactured under the Matchless brand, but named AJS, after Albert himself. The Stevens brothers eventually formed their own business, called A.J. Stevens & Co. (AJS) The company was known for building singles and V-twins in the years before World War II and took home several trophies in the early days of TT racing, which would help their sales for many years. The company existed from 1909 to 1931, manufacturing both cars and motorcycles, but went bankrupt at the end of their run, and as a result, joined forces with the Matchless Company to form Associated Motor Cycles (AMC). Although both lines continued under their own names, they became synonymous in construction, differing only in badging and trim. Though created after the formation of the AJS brand to AMC, the most notable bike produced is perhaps the 1954 AJS E95 Porcupine Racing Motorcycle. 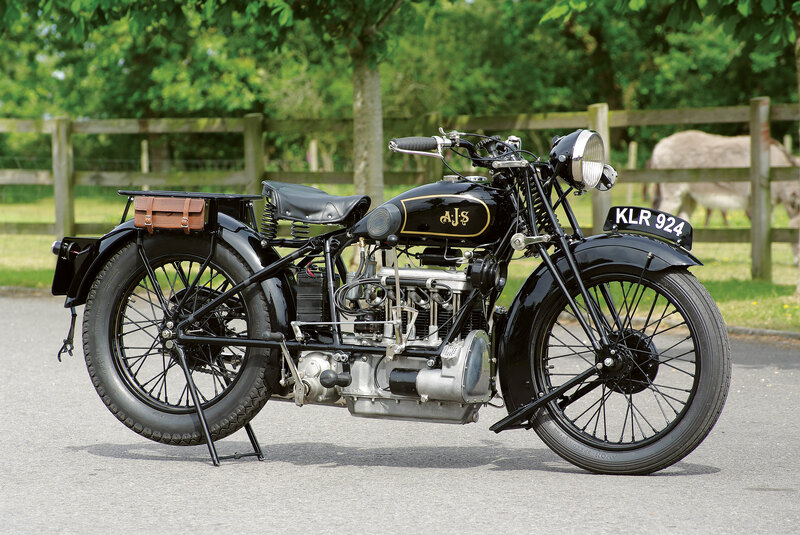 The Porcupine was built for speed, and was described as the “Holy Grail of British motorcycles”. This bike is the only twin-cylinder motorcycle to have ever won the 500cc World Championship, and was one of only four E95s to be built, deeming it as a “legendary” bike by many enthusiasts. The Porcupine features an exposed clutch, an AC fuel pump that requires the bike to be stood on its rear wheel for priming, a full 54bhp, and a streamlined design. No matter what type of antique or classic motorcycle you own, it’s important to protect it financially with the right type of Classic Motorcycle Insurance Coverage. At Condon Skelly, we know how exciting it can be to start a classic car collection. We’ve been helping our customers protect their classics with affordable, industry-leading insurance coverage since 1967. We’re a group of collectors, enthusiasts, and professionals who specialize in insuring all types of collector vehicles. For more information, please contact us today at (866) 291-5694. This entry was posted in Classic Motorcycle Insurance, Vintage motorcycle insurance and tagged AJS motorcycle, antique motorcycle, classic motorcycle, classic motorcycles, Insurance, Porcupine E95, vintage motorcycle. Bookmark the permalink.